Pictured above is the new Luminette in a solar screen fabric. The darker colors are edgey with a high contrast with the white vane and black fabric. Terra is completely new for Luminette with earthy and organic tones. This is the only multi-colored fabric available. Come in and see the new patterns today…We have all the new additions to the entire line. 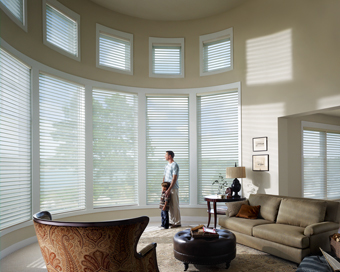 Hunter Douglas is offering a $100 rebate for every Luminette ordered. There is nothing quite like the beauty and serenity of this treatment. Coordinating Silhouettes or Duettes are available to treat your other windows. They are also on sale. Call us for details. A touch of black is a design necessity. every room needs just a smidgeon of black..
There’s something about adding just one element of black to a room that anchors the room and enhances the other colors. You and your guests may not even notice the touch of black, but it does make a difference. Black is a powerful color, so a little goes a long way in adding drama, sophistication, seriousness or masculinity. And one of the best things about black is that it never goes out of style, even as other colors rise and fall in popularity, so your black accents will probably outlast all your other design elements! Black goes well with so many colors, especially cream or any off-white – or even pure, snowy white. It also looks beautiful with bold jewel tones and soft pastels. Today, some people are even decorating with black as the primary color in their design scheme, but be cautious about using too much black – it can be overpowering. Anchor your home decor by adding a splash of black in every room this spring. 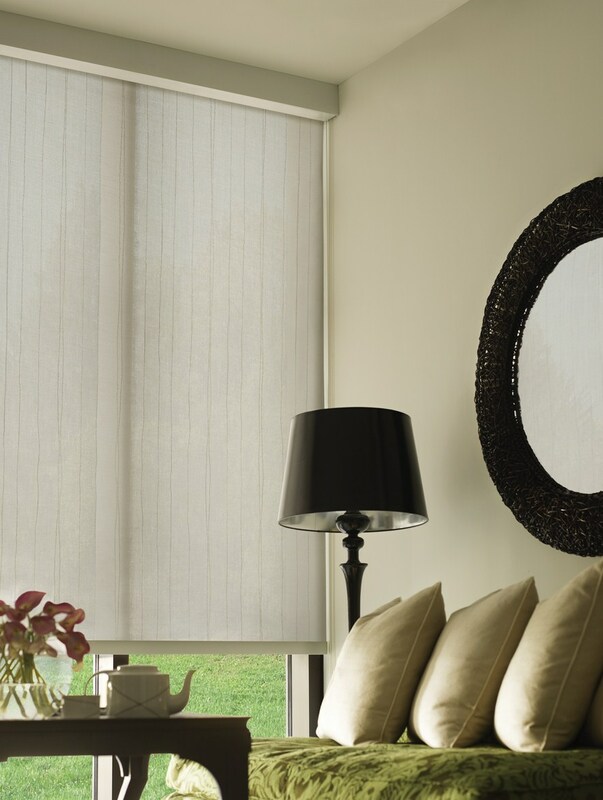 Black Out Shades or Room Darkening Shades are easily available and offer you great protection against glare into your rooms. Let’s face it…we love bright sunny days but they often interfere with the large screen TV’s of today. The glare off of window panes reflect right onto the TV screens making them difficult to watch. Not a pleasant situation on the day of the big game. 1. Honeycomb shades can be made with a black-out liner that will block out everything. 2. 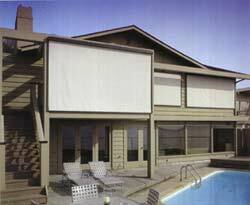 Roller shades have made a huge comeback and come in a variety of fabrics, many of which are blackout. There is also a rail system that is black-out pictured at the top of the post. 3. 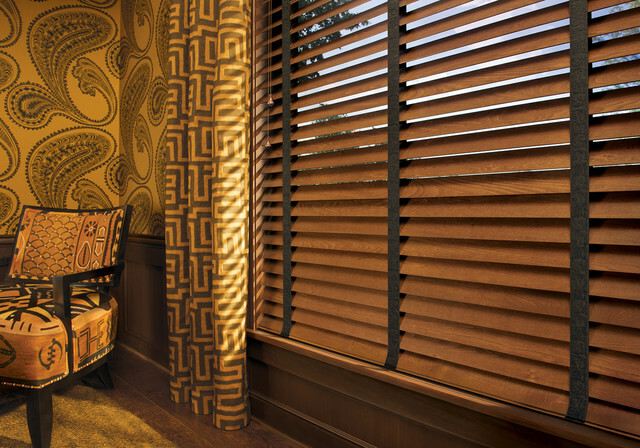 Woven Woods, Roman Shades, all have the option of liners that darken completely. 4. Draperies come in a variety of fabrics and weights and can be lined with a black-out fabric. We recommend traverse rods with the heavier draperies for ease of drawing back and forth. 5. Duolite shades offer two shades on one system. 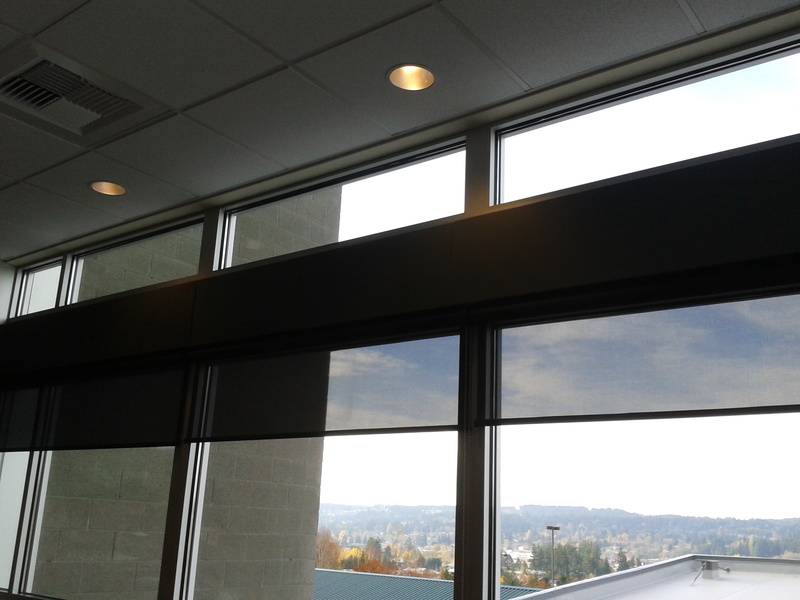 Dual roller shades also allow two shades to be installed in one headrail. Remember you do not always need to go completely black-out and room darkening may be enough. Layering treatments is an option. 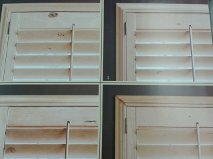 Use mini-blinds for privacy installed inside the window frame then add a drapery over for extra light control. Come in to check out the options available. It is difficult to install two shades inside the window frame because there usually is not enough room for both headrails. that adds tang to your home environment. Mustard as an interior design color has a very similar role as mustard on a sandwich. Just a dollop adds a lot of flavor and pizazz, but too much can spoil the sandwich! If you don’t like the mental image of a sandwich condiment in your home décor, you can also call this vibrant hue goldenrod or egg yolk. Mustard is a rich and warm color – and just a little bit daring! It goes well with black and white or with brown and white; and is very sophisticated when used with a gray and white color palette. Other accent colors that play well with mustard include deep reds, navy blue and lighter blue tones. Think outside the refrigerator this season and use mustard to space up your decor! It is always interesting to look back over the current year and to note the changes in consumer spending. These figures are taken directly out of our sales reports for 2013 and 2014. They are generated by using Quicken. Honeycomb has always been the top selling style of window covering in today’s market. Last year in 2013 honeycomb shades totaled 32.8% of our blind sales. This year honeycomb sales were 25.9% of our blind business. Since we had an increase this year, that means that other areas have improved. A significant increase is noted in our roller shade business. 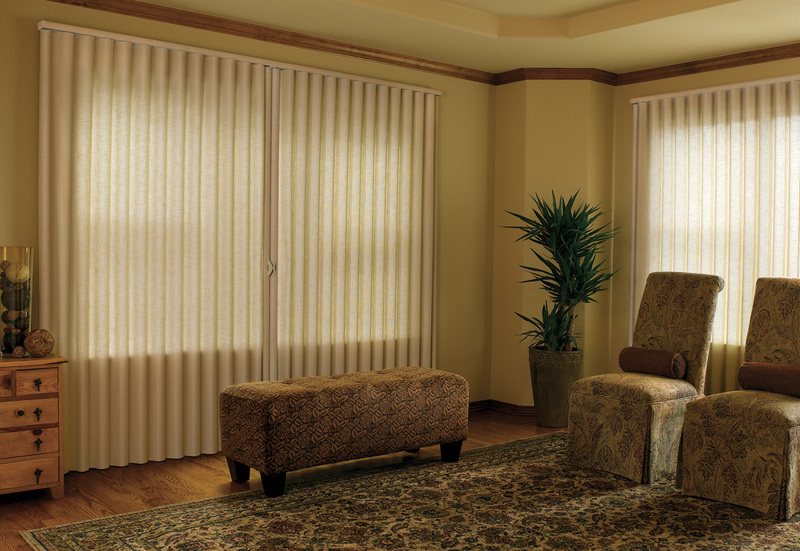 That means you as a consumer have been purchasing various types of roller shades. They come in the mesh view fabrics and in interesting privacy fabrics. 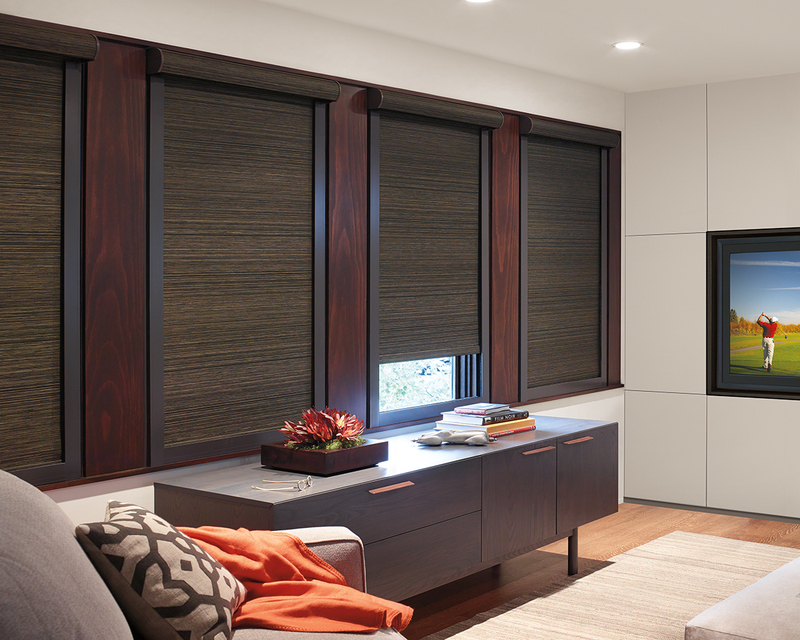 The new lift systems have removed the stigma of the crazy flapping roller shade letting loose in the middle of night. The other area of increase is the Silhouette shade. This shade is the premier crème-dela-crème product of the industry. 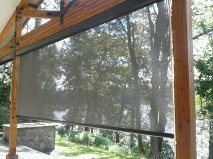 You get tiltability, sheer fabrics, and privacy which marks the versatility of this blind. Silhouette is about 70% more than a Duette with upgraded lift systems or twice as much as the basic honeycomb. Sales in custom drapery, valance and cornice category have more than doubled. This means that customers are now beginning to order higher-end products for their home. We are looking forward to 2015. Decorating with black and white can add sophistication and drama to your rooms. It’s a classic color combination. Black and white is such a simple color combination, yet it makes a beautiful statement in room décor. small touches of black and white quietly and beautifully fit in with the rest of the décor. pattern) on the bottom – or vice versa. of salt and pepper in your food! When summer gets here we make the most of our good weather. In Washington State summers are extended by protecting our patios from breezes and misty mornings. 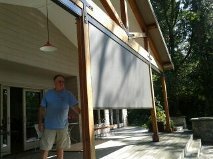 You can enclose a patio with sunscreen shades and use it year round for BBQ’s and garden sneaks when the sun pops out. Here is an awesome treatment. 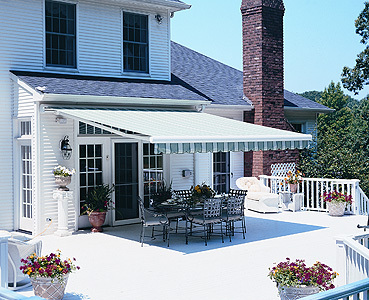 It really is time to order those sunshades or awnings you have been thinking about…Spring is the time to order summertime products so that they will be in place when the sun finally comes ashining….Be ready. 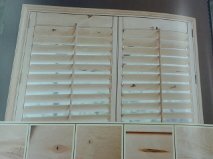 Take a look at this new collection of shutters. This distressed pine-look with knots looks awesome and will work for cabins, informal rooms or for the waterfront home. Many options are available on the frame, hinge color, and tilt bar. Draperies are making a comeback. People are hungry for textiles in their rooms. 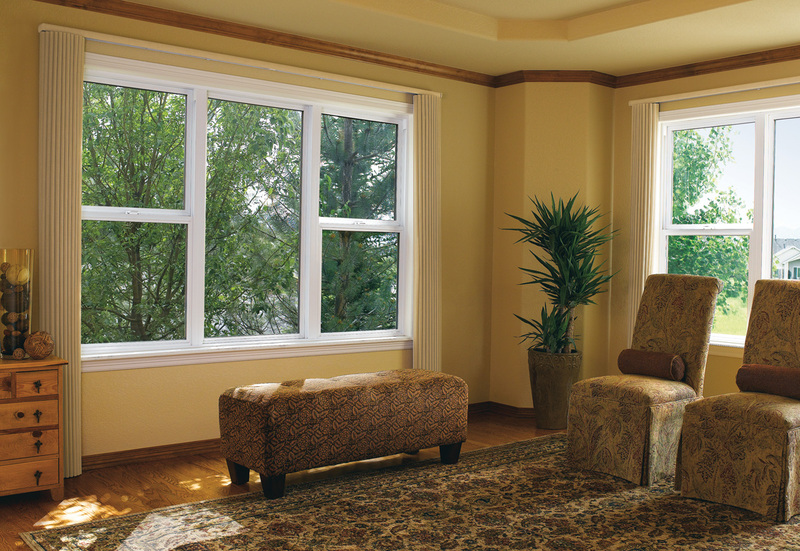 They add warmth, absorb sound, reduce drafts, and insulate large picture windows. One main drawback with draperies is the stack-back of the fabric. Windows have gotten larger and wall space smaller. 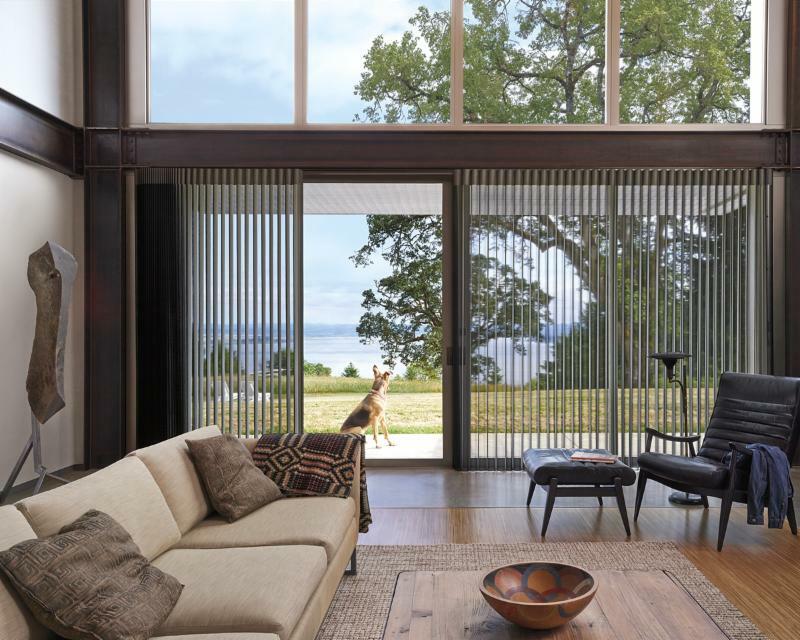 No one wants to hide the view or reduce the light that flows in from outdoors. We have to allow 30% for stack on standard white traverse rods. The stack is less on decorator rods because the drapery hangs underneath the rod allowing the crinolin to fold back instead of scrunching forward between the pleats. Here is where this new product solves a major problem. These drapes stack in 10% of the rod. Take a look at these photos of Vignette Vertical Traverse. Notice how small the stack is at each side of the window. A great application for this product is sliding glass doors. On a 6′ slider we would install a 82″-84″ rod and it would clear the glass. Come in and take a look at the samples today. Custom draperies take anywhere from 6-8 weeks but this product has a 3 week production time.